Following the defeat at Cowpens, which destroyed his light infantry, General Lord Charles Cornwallis determined to destroy General Nathaniel Greene's army. In his attempt to make his army lighter for pursuit, Cornwallis had all of his supplies burned. Cornwallis and his troops raced to the Dan River in an attempt to defeat Greene. However, Greene and his troops crossed the flooded Dan River into Virginia before Cornwallis could get there. cornwallis established a camp at Hillsborough. There, he and his troops foraged and pillaged for supplies. Cornwallis sent out requests for loyalist troops. However, his bedraggled army and Pyle's Massacre deterred many loyalists from coming forth to support Cornwallis. Cornwallis, while at camp on the fork of the Deep River, on 14 Mar 1781, was informed that Greene with a troop of North Carolina militia with reinforcements from Virginia, a troop of 3000 Virginia militia, a Virginia State Regiment, a corps of Virginia eighteen-month men, and recruits for the Maryland line, totally about 4400 men, was camped at Guilford Courthouse. Cornwallis sent Lieutenant Colonel Hamilton with what remained of his baggage train, 100 men and 20 calvary to Bells Mill which lay further down the Deep River. 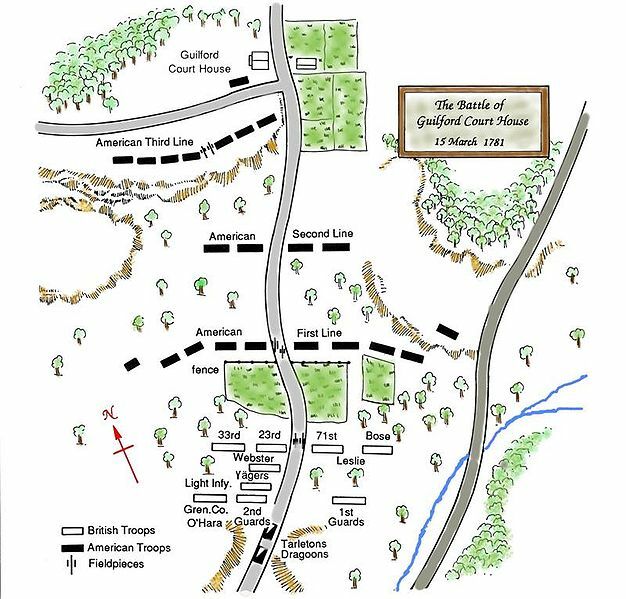 And before they could eat breakfast, Cornwallis took the rest of his 1900 men to Guilford Courthouse to meet Greene. They arrived at midday. To start off the battle, Colonel Banastre Tarleton's Dragoons met Lieutenant Colonel Henry "Lighthorse Harry" Lee's Dragoons near the Quaker New Garden Meeting House, about four miles from the courthouse. The British 23rd Regiment of Foot sent reinforcements and Lee withdrew to Greene's main body. Greene had prepared his troops in three lines, similar to Cowpens, except the lines were much further apart and could not adequately support each other as the troops at Cowpens could. The first line of defense was the North Carolina militia with backcountry riflemen on each end to snipe British advancement. The second line contained the Virginia militia. The third line, 400 yards behind the second and placed at an angle to the road, contained the Virginia Regiment, Delaware Regiment, and the 1st and 5th Maryland Regiments. The first line was behind a picket fence. The North Carolina militia rested their arms on that fence and were able to take precision aim at their British targets. The militia also had rifles with a much longer range than the British muskets. 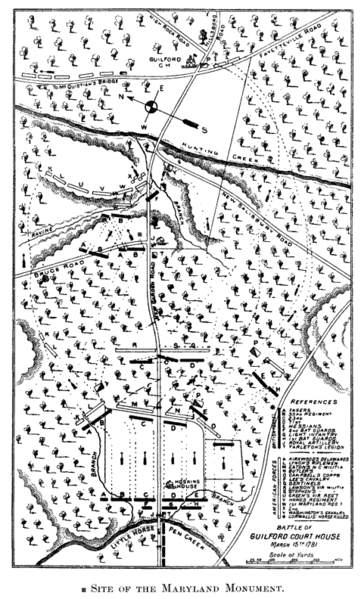 Cornwallis elected to have his troops attack on the west side of the road, since the east side was all open. He started with a short barrage of cannon fire and then his men started marching up the road. When the British were about 150 yards away, the Americans fired their first shot. The British kept marching until they were within musket range to fire their return volley. After the volley, on the command of Lieutenant Colonel James Webster of the 33rd Regiment of Foot, the British charged forward, stopping at about 50 yards because the North Carolina militia had their arms resting on the fence and taking precision shots at the advancing British. Webster continued to exhort the men to advance. The North Carolina militia fired one more shot, then turned and fled to the woods, discarding their personal equipment as they ran. The British continued to advance, however, the woods were too dense to allow practical use of the bayonets. The advanced around the flank of the second line and onto the American third line. The British encountered heavy resistance and took significant losses. The 71st Regiment, Grenadiers and 2nd Guards moved up the center. The 23rd and 33rd Regiments of Foot advanced on their left. The 1st Guard and the Hessians were on their right. Lee's Legion was attacking the 1st Guard and Hessians and slowing their advance. The British Guns and Tarleton's Light Dragoons kept pace along the road. The 2nd Guard followed the road around the courthouse and found a large force of Continentals. They immediately attacked them and captured two 6-pound guns. They followed the Continentals into the woods and were repulsed by Lieutenant Colonel William Washington's Light Dragoons and the 1st Maryland Regiment. The British abandoned the two guns they captured. Lieutenant Macleod, commander of two British 3-pounders was ordered to fire on the Dragoons. Many of the British casualties were harmed by "friendly fire". Americans left the field and headed into the woods. The British 23rd, 71st and part of the Calvary were ordered to pursue but not too far. Tarleton and the remainder of the calvary were ordered to put an end to Washington's attacks. Although the British technically won the battle, they lost nearly a quarter of their force. Cornwallis had his horse shot out from under him during the battle. The battle only lasted about ninety minutes. British losses were 93 killed, 413 wounded and 26 missing/captured. The Patriot losses were 79 killed, 185 wounded, 75 wounded prisoners, and 971 missing. Many of the militia fled to their homes. After the battle, the British were spread over a wide wooded expanse. They were without food and shelter. During the night, torrential rains began and fifty of the wounded died during the night. Webster, wounded during the battle, died a fortnight later. Greene left with most of his forces intact and headed for South Carolina to attempt to recapture the colony from Lord Rawdon, whom Cornwallis had left in the field. Cornwallis retired to Hillsborough, where he raised the royal standard. In a few weeks, he left the heart of the state and marched to Wilmington, North Carolina to recruit and refit his army. In a matter of months, Cornwallis would move to Virginia and the end of the American Revolution.